Find the RV of your dreams at All Seasons RV! Not only are we the best RV dealership in Muskegon, but we're also one of the top Michigan RV dealers! 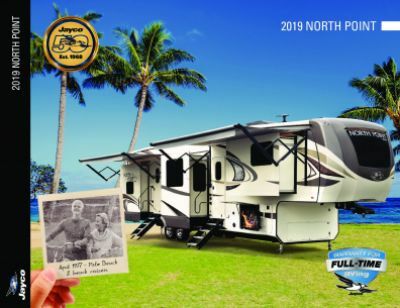 Visit us at 4701 Airline Rd Muskegon Michigan 49444 to see the 2020 Jayco North Point 377RLBH for yourself! Call us at 231-739-5269 to talk to one of our RV experts about this 5th Wheel! Need some shade when you lounge outside? Pull out the 17' 0" awning with ease! This RV is exceptionally reliable on the road, with a sturdy GVWR of 16750 lbs. This 5th Wheel can accommodate the whole family - and then some - with its roomy 42' 8" length and 8' 0" width! The 4 slides open up easily to create a spacious living area where everyone can stretch out and relax! When the weather outside isn't cooperating, you'll just move the fun indoors, staying cool on the hot days thanks to the 15000 BTU a/c unit. And when it's cold outside, the 40000 BTU furnace will keep you warm and toasty! The comfort of home travels with you in this 5th Wheel! It has enough cozy sleeping accommodations for up to 9 people, and the bedroom is perfectly snug and private! Its Queen bed is heaven sent after a long, tiresome day on the road! With a modern shower and a sleek Porcelain Foot Flush toilet, you'll enjoy the bathroom anytime! You'll never have to trudge through the campground to the cold, damp community bathroom again! This RV also has a 85 gallon gray water tank and a 50 gallon black water tank. 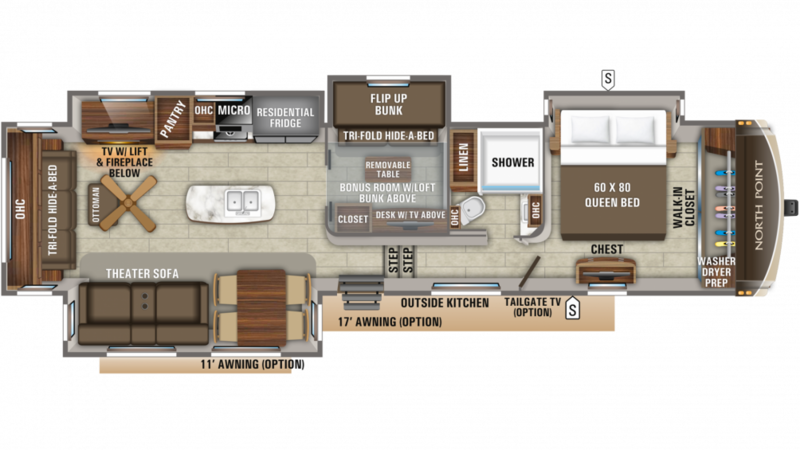 The Loft in the bunkhouse contribute to a total of 4 beds inside this 5th Wheel. Guests and family members can sleep in the privacy of the loft area, found up above the living area in this RV!